Today, the Supreme Court repelled the challenge made at the instance of Congress against the nomination of three BJP members to the Puducherry Legislative Assembly by the Central Government. 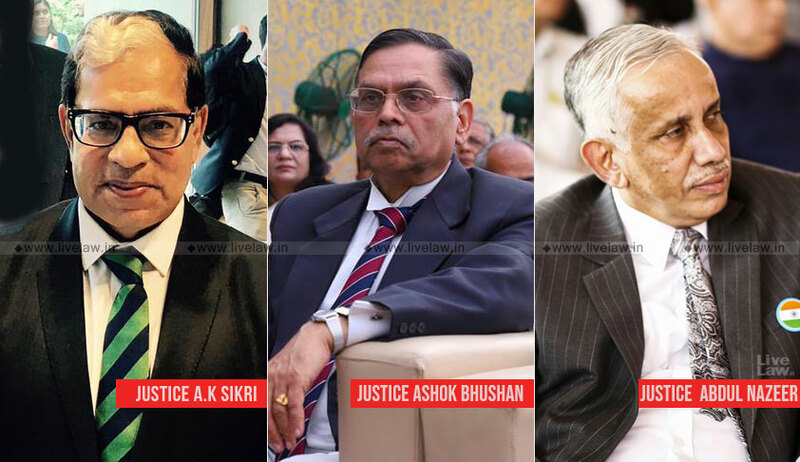 The Bench of Justices A K Sikri, Ashok Bhushan and Abdul Nazeer dismissed the appeals filed against the judgment of Madras High Court judgment of March 2018, which had upheld the nominations. The challenge pertained to nomination of three members- V Saminathan, KG Shankar and S Selvaganapathy- by the Centre, in exercise of powers under Section 3(3) of the Government of Union Territories Act, 1963. The main plank of challenge was that the nomination could not have been made without consulting the Puducherry Government. The appellants- K.Lakshminarayanan, a Congress MLA and S Dhanalakshmi- contended that there were precedents of consulting the government before nomination, and hence consultation has crystallised into a constitutional convention. Unilateral nomination without consultation violated the principles of co-operative federalism and collaborative federalism, the appellants argued. It was further contended that the Lieutenant General(LG) had not sent any nominations and the Central Government had made nominations on its own. In relation to Puducherry, 'Central Government' has to be understood as the 'LG'. Reliance was placed on latter part of Section 3(8)(b)(iii) of General Clauses Act which stated that 'Central Government' shall include 'administrator' in relation to a Union Territory(UT). The SC rejected the contention that Central Government has to be understood has LG in relation to Puducherry. It held that Central Government shall be understood to mean 'President'. The latter part of Section 3(8)(b)(iii) will not control this ordinary understanding of the definition of Central Government. The Court also noted that no power has been delegated to the LG to nominate members. The argument of the appellants was that the Administrator is required to consult the Government in relation to decision regarding business of government as per Rule 4(2) of the Rules of Business of the Government of Puducherry, 1963 read with Rule 48, framed under Article 239 of the Constitution, read with Article 306. The bench noted that Section 3(3) of the 1963 Act empowered the Central Government to nominate not more than three persons to the Legislative Assembly of the Union Territory. Therefore, nomination was a statutory power vested on the Central Government. Hence, nomination cannot be regarded as a business of Puducherry Government. "we are of the clear opinion that nomination in the Legislative Assembly of Puducherry is not the Business of the Government of Puducherry. It is a business of Central Government as per Section 3(3) of Act, 1963 which is to be carried out in accordance with the Government of India (Allocation of Business) Rules, 1961 and Government of India (Transaction of Business) Rules, 1961", concluded the judgment written by Justice Ashok Bhushan. Principles of Co-operative Federalism Not Violated. The Bench noted that Article 239A of Constitution authorized the Parliament to enact law to constitute legislative council for Puducherry. Accordingly, the Parliament has enacted the Government of Union Territories Act 1963, and Section 3(3) of it empowers Central Government to nominate not more than three members. The Court further noticed that Union Territories are not States and observed, "These Union Territories,ordinarily, belong to the Union (i.e. the Central Government) and therefore they are called 'Union Territories'. That is why they are governed under the administrative control of the President of India". "The Constitution of Legislative body for Union Territory being entrusted to the Parliament by Constitution and there being no indication in the Constitutional provision or provisions of the Act, 1963 that said nomination has to be made with concurrence of Government of Union Territory of Puducherry, we fail to see any substance in the argument of Shri Kapil Sibal that by nominations made by Central Government, federal principles or principle of cooperative federalism has been violated"
That the Government was consulted on previous occasions before nomination did not by itself result in a constitutional convention, held the bench. The views of the Government were taken in cases when the Government of Puducherry and the Central Government were of the same party or allies. There was no uniform precedent as such. Also, the consultations were not done by parties with the belief that they were legally bound to do so. Hence, the Court did not find any established practice or convention to the fact that names for nominations to members of the Legislative Assembly has to emanate from Chief Minister and can be made by the Central Government only after concurrence by Chief Minister. The Madras High Court had made a recommendations to the Parliament to frame laws to ensure, inter-alia, that : "If the nominated MLA belongs to a political party on the date of nomination, it should be made clear that he shall become part of the legislature party of that political party. If there is no legislature party in the house on the date of nomination, the nominated MLA/s shall constitute the legislature party of that political party"
The High Court had also made certain other recommendations to the Parliament. All those recommendations were set aside by the SC, holding that Courts cannot issue directions to the legislature. Further, there were already laws and regulations in place regarding legislative assembly. Hence, the recommendations by High Court in paragraph 5 of the judgment were set aside. In all other aspects, the appeals failed.